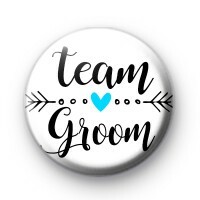 This cute 1-inch wedding pin badge has the text Team Groom in a handwritten style font and 2 arrows either side of a blue heart. These badges are ideal for Stag Parties or to give out to your guests on your Wedding Day as fun keepsakes. We also have Team Bride Badges available too. All our badges are handmade with love from our Cornish Workshop.